This entry was posted in Racing on May 13, 2012 by Steve Tilford. 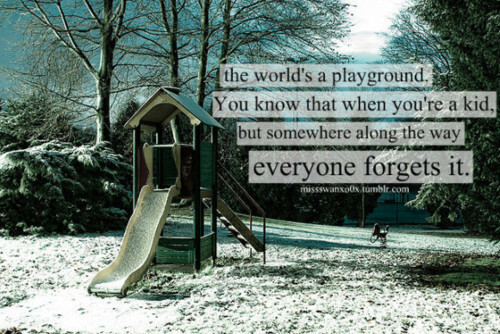 I was watching some silly Jim Carey movie last night and there was a line that said, “The world is a playground. We all knew that when we were kids. Somewhere along the way we lost that thought.” Or something like that. I was thinking about that later when I was walking Bromont and I think that is true to a certain extent. Many people forget that they can still do child like things and still be adults. Quite a few years ago, the father of my high school girlfriend was thinking about getting a new bicycle. He called me up out of the blue and asked me about what kind of bike he should be looking for, etc. I told him I’d bring a bike over to his place and let him try it out. So, I loaded up a MTB bike and drove over there. I thought he’d be more comfortable with the upright position than that of a road bike He was in his 50’s and said he hadn’t ridden a bike since he was a kid. After I got over there and explained how the shifting worked, etc. he took off. I was surprised how unstable and frightened he seemed riding, something like a kid just learning how to ride. He was a pretty athletic guy, so I assumed he knew how to ride a bike. But, it he didn’t very well the first couple minutes. Anyway, after a few minutes, he got it down pretty good and disappeared for 10 minutes or so. I wish I was literate enough to describe his facial expressions, in detail, when he returned. They were of pure joy and freedom. I had been pretty intimidated by the man for all my life. I’d met him when I was hardly a teenager. But, after seeing him relive his youth, and realize what he’s been missing, by riding a bicycle for only 10 minutes, I realized that he wasn’t that much different than me. It was a pretty good moment for both of us. That was the first time I’d seen someone transform right before my eyes. I’ve seen it since, a couple times, but nothing nearly as personal or to that extreme. As cyclists, most of us, obviously, aren’t main stream. It takes a certain person to dedicate such a large percentage of their lives to something as “silly” and “indulging” as riding a bicycle. But, we’ve learned through the many, upon many, hours of pedaling, that the process of living a lifestyle of a cyclist is way more fulfilling than just pedaling around for an hour a day. Our fringe benefits apply to most aspects of our lives. It takes a certain amount of discipline to allow yourself not get caught up in the adult world so much and see the world through the eyes of a child. When you do that, it makes life much more enjoyable. I’ve learned so much more about the places around me because of a bike. Some of my best rides have been “mess around” rides just to explore. I think most people are just in too much of a rush to notice life around them. Kids just don’t do that….they are very present in whatever they are doing. I like meeting people while riding too. That guy you met with the blower was interesting. You would’ve never seen him if you were in a car. Cool post. Good blog. Simple and pure, just like the bicycle. Steve, my father is literally dying next to me as I read this blog. (He has been on home hospice care for a week.) Like many dads, he always taught me to take time to “smell the flowers.” Reading your blog everyday is one if the ways I heed his advice. I was particularly touched by your sentiments this morning and reread this out loud to him. He is now too weak to speak but he nodded his head in approval. Thanks for reminding us how fortunate we are to experience the child like joy of cycling. And for sharing your thoughts that help us pause and contemplate the simple pleasures and wonders of life. Great response from Neil, too. Peace to you and your family. One of the highlights of my riding was when my daughter and I were on our tandem and we stopped by a friend we know who is blind. We asked her if she would like to see our bike, she came out and felt the top tube, the bars, shifters and gave her approval. I asked if she’d like to go for a ride and she couldn’t say ‘yes’ fast enough. We took a leisurely ride around the neighborhood for ten or fifteen minutes and the smile on her face was priceless. I think she was in her mid-50’s at the time. Great post today. I have my bike in my office right now after the ride into work today and a nice scrape on my neck and shoulder from a mountain bike crash on Saturday (darn immovable trees). As I try to explain to others at work why I look like I was attacked by werewolves because of the scrape on my neck so many don’t get it. It is the joy of being a 40+ year old kid who loves to ride his bike! In contrast I was able to finish teaching one of my kids this weekend how to ride a bike without training wheels and to see the freedom, excitement, and sense of accomplishment on his face is just pure priceless fun! Not much beats that. Dale, that is a fantastic story. It brought tears of happiness to my eyes.